While the debate rages and public condemnation pours in from around the world at the planned burning of a Koran by evangelical pastor Terry Jones on Sept. 11, leaders at Camp Lejeune, N.C., are teaming up with civic officials to remember that day in 2001 in a different way. 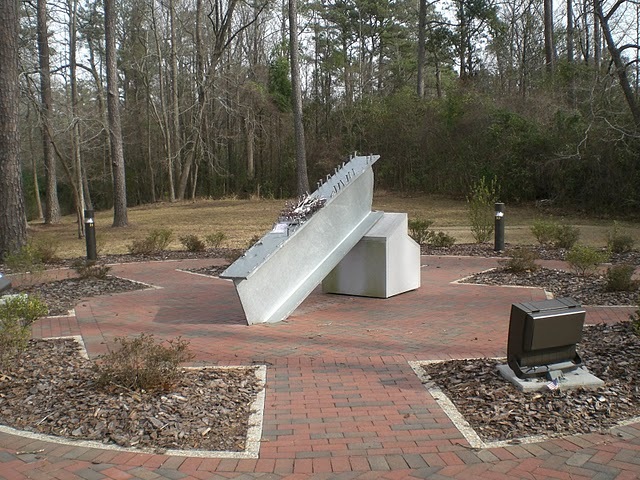 The WTC beam at Memorial Gardens in Jacksonville, N.C.
At Memorial Gardens in Jacksonville around a beam from the World Trade Center presented by New York’s first responders to Camp Lejeune in 2003, there will be a moment of silence at 8:46 a.m., a minute after the first plane struck the skyscraper. That silence will be broken by the sound of sirens from the emergency vehicles of law enforcement, fire and rescue crews, and music will be played by a component of the 2nd Marine Division band and students from Jacksonville High School. The observance ceremony will be hosted by the Onslow Civic Affairs Committee and begins at 8:15 a.m. Saturday. Very educating story, saved your blog with interest to see more information! Great goods from you, man. I have understand your stuff previous to and you’re just too wonderful. I actually like what you have acquired here, really like what you’re saying and the way in which you say it. You make it entertaining and you still take care of to keep it wise. I cant wait to read far more from you. This is actually a terrific web site.